Let superior performance and comfort lower your car. 1. Maintain or improve a smooth, comfortable ride. 2. Increase handling by reducing body roll and squat in search of overall suspension balance. 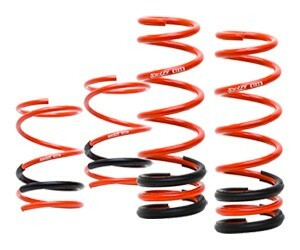 Most enthusiasts have had experiences with the typical harsh and uncomfortable ride from lowering springs. Performance is often overlooked by manufactures simply because it is easier to lower a vehicle for aesthetics. The end result is usually a bumpy ride that causes a decrease in traction, or excessive worn shocks caused by lowering the vehicle beyond the usable stroke. As you can imagine, keeping or improving the comfort level while increasing performance is not an easy task, especially since these two aspects contrast with each other. Where most of the competition simply gave in to the easier method, Swift Springs decided to tackle this issue by creating our own material (H5S.TW), and unique manufacturing method that works very well for this material. Working in unison, the material and manufacturing method provides a superior level for both comfort and handling. We utilize spring design with fewer coils which not only allows us to decrease un-sprung mass but to also completely eliminate the chance of coil bind, while increasing the amount of usable stroke. Our proprietary material (H5S.TW) has a much quicker transient response, reacting to any road conditions which, in turn, cause a much smoother ride where other springs will skip on the harsh road surface, our spring will react to the road surface as needed. With the Swift Sport Springs, we expect both street and circuit users to experience an increase in all aspects of suspension tuning from performance to comfort. Suspension usable stroke for the cars now a day is very limited compared to before. To let the suspension do its own job efficiently, many car manufactures use bump rubber as a part of a suspension's functional part, not only to limit the shock stroke but to prevent the shocks from bottoming out. This scenario also applies to real world racing, and we use this as a primary focus when designing the sport springs. Swift developed each Sport Springs application based on the individual vehicle's unique characteristic. Put simply, a luxury car will maintain its luxury ride, and sports car will maintain its sports car feel.